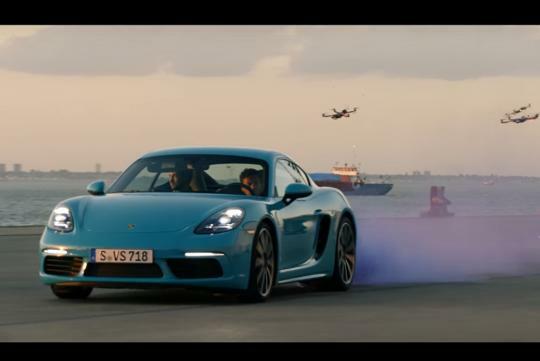 Porsche has teamed up with YouTube Gamer Ali-A for its latest marketing video. In the collaboration, they came up with a little cat and mouse game, where a swarm of race drones piloted by professionals would try to get really close to the car. How the game works is when the drones 'catches' the sports coupe, smoke will be released as the proximity sensors lit up. With three checkpoints to go through and three 'lives' or tries before the Porsche loses, viewers will be in for a good show. For those wondering who's the one behind the wheel sliding everywhere, it is stuntman Mauro Carlo, who once held the record for the longest drift in a car. He did the drift in a 2011 Mercedes-Benz C63 AMG for a good 2,038m before one of the rear tyres blew. The PDK is real quick!